Home What is Junior Handling? It is a: Hobby and a Sport, it is Competitive and Fun. There are 7 classes: You NO LONGER move up ON your Birthday. year preceding. This class is Optional, and Non-competative. preceding, who have not won '6' 1st places in the same class with competition. preceding, who have won '6' 1st places in the same class with competition. '6' 1st places in the same class with competition. Eye contact with the judge, and NEVER EVER put yourself between the judge and your dog. If you are first in line, Ask the handler behind you, if they are ready to go. Your apparel and the entire way you present yourself to the judge is very important. NO high heals... NO low cut tops... NO low cut jeans.... NO Short or tight skirts... !! Brings you a LONG way. !!! Your �Look', your �Posture', your 'eye contact', your 'attitude'. LOVE what you are doing, and let it show. Smile LOTS. Pay attention to what is going on, remember the first and last dog, and be ready for your turn, do not chit chat with others, Keep you eye on the judge and your dog at all times. Watch what the judge asks the other handlers to do, as she may ask a sneaky question, like: repeat the pattern the last girl did. If you are not paying attention, you will not know what to do. How you treat your dog is extremely important. Talk to your dog, Never hit your dog, do not raise your voice, Treat your dog like your best friend. 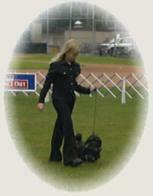 You and your dog, should be presented as a team. You will be asked questions on dog anatomy, Breed specific questions about the breed you are showing, or other dogs in the ring, dog faults, dog show questions about groups. In Higher groups, ANY dog related question is asked. A judge may place you at the end of the line, making it look like you are last, JUST to judge your sportsmanship, facial expressions & attitude. Basically judging your Reaction. Remember the show results are NOT final, until the ribbon is handed out. KEEP SHOWING your best. Every dog has Its BREED REQUIREMENT, for grooming, Stacking, moving and attitude. 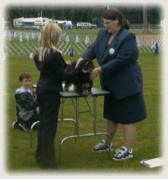 You MUST be able to Properly present YOUR breed to the Judge. In Senior and Open classes, they may be required to change breeds, and so, they Must know how to present a variety of breeds.